When veteran planner Leigh Warren tried to step back from the wedding industry to raise her twins, area vendors kept calling for help with sewing projects for receptions and interiors alike. As her blossoming side hustle as a seamstress-for-hire took off, she needed a partner-in-crime to keep up with demand. Enter fellow wedding biz vet Caroline Rayman. The pair teamed to create The Social Spool (@thesocialspool) and today focus on marrying innovative designs and textiles with fresh Southern style. From custom table linens to fanciful draping (the latter being event-speak for hanging swaths of billowy fabric as partitions, ceilings, installations, and more), these two mavens transform most any space into an extravagant, artistic setting. 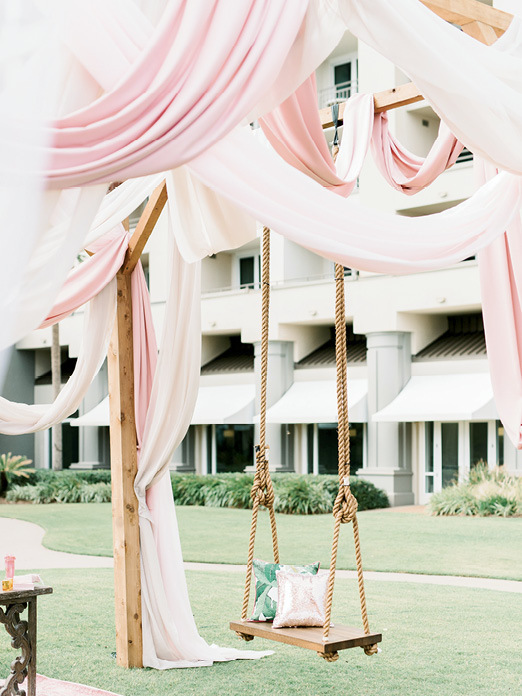 “The more freedom we have to combine different textures and color combinations,” says Leigh, “the more we can bring a unique quality to each event.” So far, Leigh and Caroline have hung 3,500 yards of fabric—nearly the length of 30 football fields. Leigh and Caroline start each installation by taking measurements of the site, then sketch a design, sort out the math, source fabrics, and sew everything from table runners to pillows to window treatments and more. In the hours leading up to a wedding and reception, you’ll find them unpacking custom pieces and teetering on ladders while weaving, stapling, and, yes, draping hundreds of yards of fabric. Under their hand a bare tent becomes an elegant hall and a vacuous warehouse space turns into a ballroom. As for cost? The Social Spool gals advise you plan for draping to cost between eight to 15 percent of your wedding’s overall budget. And what happens to the leftover fabric? Leigh and Caroline launder, reuse, and repurpose fabric when possible or they donate material to Charleston Stage, the Holy City’s own theatre production company. Now that’s a repeat performance we can get behind.